OTG Goggles is an abbreviated way of saying "Over the Glasses Goggles." 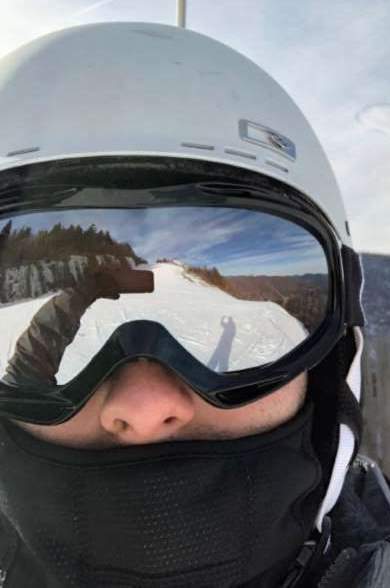 This type of eye-wear is used in a wide variety of snow sports including skiing, snowboarding, and even riding ATVs in the winter. They're a great option for people who can't wear contacts or don't want to make the commitment of having custom-made prescription snow-goggles. People commonly ask the question: Can I go skiing with my glasses? The answer is: Yes, you can by using goggles that will properly fit your head with your glasses underneath. We've created this guide to help you find such goggles and help you understand the confusing features that surround them. Click any of the links above for more details on each one, or keep reading for the entire guide. When it comes to OTG ski goggles, there are a multitude of factors that separate the cheaper goggles from the most expensive. Do you need all the bells and whistles if you're a beginner or are just getting acquainted with the sport? Absolutely not. But they are nice to have and are certainly something to consider if you plan on spending more time skiing or snowboarding. Additionally, any new pair of goggles from 2018+ is likely to have at least some of these. Just look out for these features if you plan on buying older models. While not really a luxury feature nowadays, vents prevent fogging by letting cold air into the goggles. If you're wearing glasses under them, this is extremely important as it will help keep the lenses on your glasses cool. 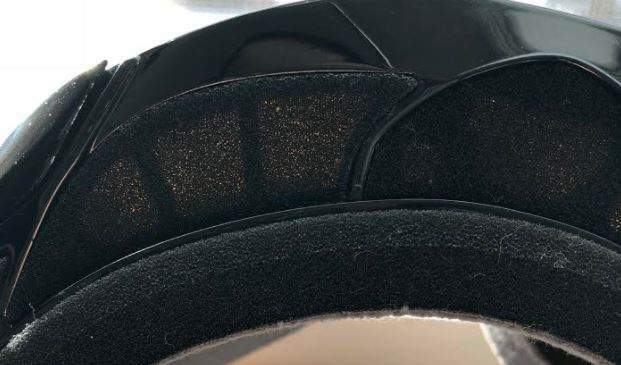 The vents on these ski goggles can be viewed through the porous part of the padding. The vents facilitate air flow as the user goes down the mountain. As part of their ventilation system, some OTG goggles even come with a battery powered fan. Dual-pane lenses (much like double-pane windows) harbor a layer of air between each lens. 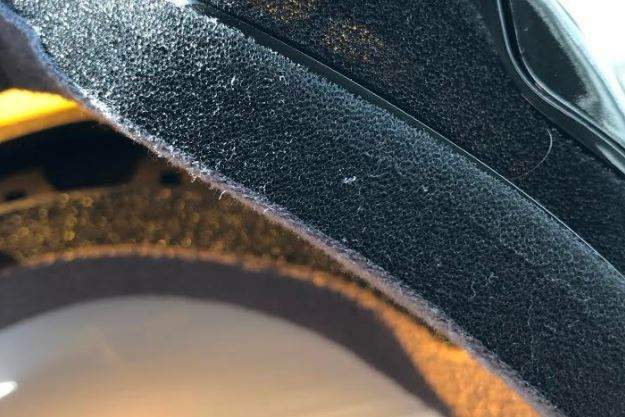 This layer of air helps keep the temperature inside the goggles as close to the outside as possible, preventing moisture build-up. Look closely, and you can see how there are two different sets of lenses on these ski goggles. 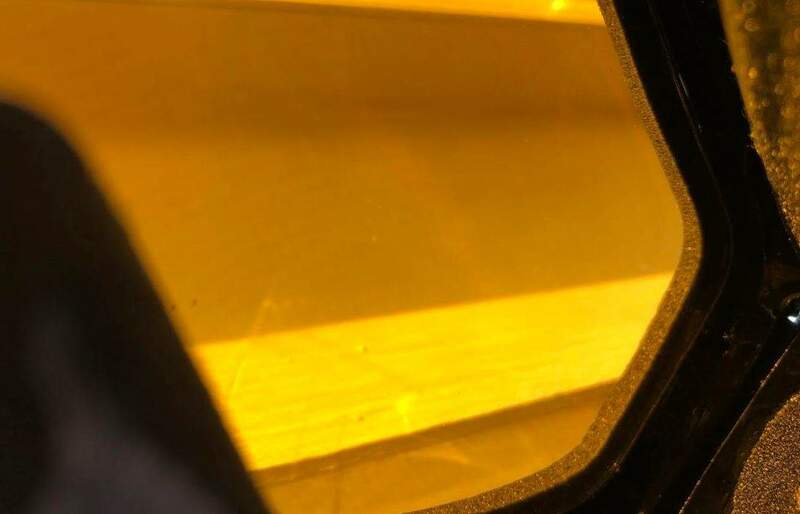 This is what is known as "dual-pane" lenses. Goggles with dual-pane lenses also may have a mechanism regulating of air pressure. Pressure changes occur as you ascend and descend the mountain. These pressure changes cause the air between the panes to expand and contract, sometimes resulting in a slight distortion of the user's vision. Built-in valves let air come in and out, reducing the distortion. How comfortable goggles are usually comes down to the quality of the padding and how they rest on the user's temples. The quality of the padding around the goggles (shown here) can impact how a user feels when wearing them for long periods of time. This is obviously subjective and will depend on your other gear as well. For example, if you're wearing a ski mask, the feeling of the goggles on your face is going to be less noticeable. As such, nicer padding may not be warranted. Aside from how they feel on your face, some more expensive goggles come equipped with moisture-wicking foam. This is something else you might not notice as much if you're wearing a mask. Visibility refers to how much of the goggles you see when you're looking outwards. Higher end goggles typically won't interfere with your field of vision at all, whereas you may see the goggles with cheaper models. When trying to keep a look out for dangerous terrain, the less interference with your peripheral vision, the better. Wave length filtering is perhaps the most exciting feature of more advanced goggles. Lenses designed with technologies such as ChromoPop or Prizm will allow you to see more clearly, especially on days with heavy sun and glare by filtering out the kinds of wavelengths the eye has trouble distinguishing -- typically where the colors of certain wavelengths cross over. It can be the difference between a clean and crisp picture and having everything look washed out. Different lenses have different levels of VLT (visible light transmission). Whether it's extremely bright out, nighttime, or somewhere in the middle, there are different lenses for each job. The darker it is, the more VLT you want. Lenses designed for skiing at night are virtually clear because you want to let in the most light possible. For extremely sunny days, you'll find lenses that are darker or maybe even black. Most of the higher end goggles will have interchangeable lenses with high VLT and low VLT lenses included. Spherical Lenses are the lenses that you'll typically find at the higher price points (but not always). They get their name because of their vertical and horizontal curves designed to reduce glare and enhance peripheral vision. Their design mimics the shape of the human eye, which also causes less distortion. On the other hand, cylindrical lenses look less like a bubble than spherical lenses do. Rather than being curved on both axes, they are only curved horizontally. As a result, most people will notice more glare and distortion when wearing goggles with these kinds of lenses. It's important to note that some riders and skiers do actually prefer cylindrical lenses. Despite the fact that spherical lenses are the "more advanced technology," there are some face shapes that don't do as well with them. Just because goggles are designed to go over your glasses, it doesn't mean that they will fit you specifically. Glasses and heads come in all different shapes and sizes. Because most goggles are designed to be "one size fits most," you won't know whether they fit for sure until you try them on. The Gonex Oversized are great for anyone who wants a pair of mid-tier goggles without spending a ton of money. They accommodate prescription glasses up to 5.51" x 2.36" and are compatible with virtually any ski or snowboard helmet. While they don't have any of the latest wave length filtering technology as some of the really top tier goggles, they're still great for the average skier or snowboarder. Some people may find that these goggles are too big for their head due to the fact that they are over-sized. They can be prone to cosmetic damage. Some colors appear different in person than in the company's photos. Company doesn't seem to sell replacement lenses. If you're an avid skier, snowboarder, or winter outdoors-person, then these goggles make an excellent choice. They have many of the high-end features we've discussed and are backed by a lifetime warranty from Smith, a huge name in eye-wear. These aren't very openly marketed as OTG goggles as some of the others are, but are used that way by many people and are stated as "eyeglass compatible" on the manufacturer's website. Includes two lenses that you can swap out quickly, one for low light and one for bright light. Foam structure and layout designed to reduce pressure on the temples, preventing headaches during long periods of use. Includes all carrying accessories for the goggles themselves and the replacement lenses. Porex filter for regulating the air pressure in the lens chamber. This prevents distortion during elevation changes. Chromopop technology that filters out hard to see wavelengths, making your vision clear and crisp. May be too costly for the average user. Some people experience issues when swapping the lenses. These goggles are our budget pick for anyone who heads to the mountain irregularly. That's not to say that they are bad in anyway (I actually own a pair and like them), but they lack some of the bonus features such as large spherical lenses, removable lenses, and wave filtering technology. They fit glasses with a max height of 1.65" and a max length of 5.3". Has a simple yet effective ventilation system. Comes with dual layer lenses and anti-fog coating. Manufactured in a wide variety of different colors. They're a bit small for OTG goggles -- only good for small glasses. Some people may notice the outer rim of the goggles in their field of vision due to smaller size. These are meant for the person who wants well-performing and long-lasting goggles, but is turned off by the typical high price points of some of the big names. They look big and professional, and they leave plenty of room for glasses underneath. It's hard to think of a skill level that can go wrong with these. Large spherical lenses measuring 7.2" x 3.9". This gives them an excellent field of vision and stylish look. Solid ventilation system that lets cold air in and hot air out. Easy to swap out magnetic lenses. Simply remove current lens and stick on a different color. Comes with carrying pouch and carrying case to store easily. May be too wide for people with smaller heads. Lacks the wave length filtering technology of some of the big brands. The Oakley Flight Deck Goggles with Prizm technology are awesome for the serious rider or skier. They are designed for people who need to see every little detail in the mountain and react quickly and accordingly. The technology is endorsed by many big names in the industry including Olympic Gold Medalist, Shaun White, and Nicolas Muller, one of the greatest names in snowboarding. The Flight Decks aren't marketed as specific OTG goggles, but are often used that way. These have the ability to easily switch out the lenses for different conditions. Rimless design for wide look and great peripheral vision. Latest and greatest technology in wave-length filtering. May be too costly for the average person. Many people find fogging to be an issue with these. For any pair of goggles, fogging is almost inevitable. Even though design and technology can go a long way to mitigate fogging, it's not something that can be completely avoided. For people with glasses, this raises extra cause for concern. Check out this guide to learn the 13 best ways to prevent goggles from fogging up.